Описание: A Membrane BioReactor (MBR) is the combination of a membrane process (e.g. microfiltration/ ultrafiltration) with a suspended growth bioreactor. When used with domestic wastewater, MBR processes can produce effluent of high enough quality to be discharged to waterways, or to be reclaimed for urban irrigation. Other advantages of MBRs over conventional processes include small footprint, easy retrofit and upgrade of old wastewater treatment plants. 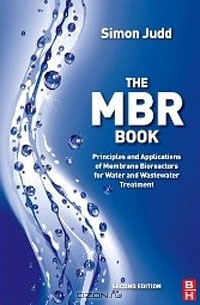 The MBR Book covers all important aspects of Membrane BioReactors in water and waste water treatment, from the fundamentals of the processes via design principles to MBR technologies. Industrial case studies help interpret actual results and give pointers for best practice. Useful appendices provide data on commercial membranes and international membrane organizations.